The visual appearance of the contemporary Asian architectures in the big cities, such as Taipei and Tokyo, varies from grandiose and tall skyscrapers to artistic and Zen centers. One of the most innovative projects on the continent are the “Asian Cairns” in Shenzhen, China. They are an innovative architectural project of the Vincent Callebaut Architectures, combining in one the rural and urban environment. 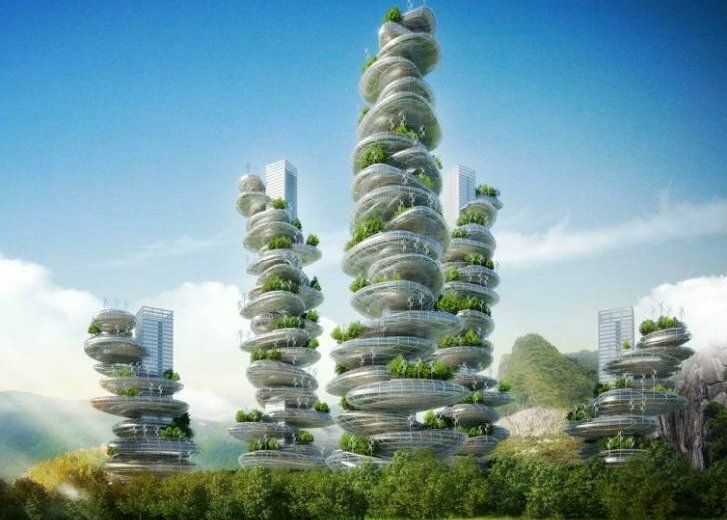 With the distinctive advanced architecture, the six skyscrapers of the project will be built to look like a pile of gigantic stones, piled on top of each other, surrounded by greenery on each floor. For the project, which will be located on an area of 320,000 m², as main energy sources are planned to be used sun and wind – a feature that makes it an extremely energy-efficient plan. The towers skyscrapers – another futuristic part of the “Asian Cairns” – will use abstract biomorphic shapes and Bionics to build an architectural masterpiece that can be treated and cultivated by the Chinese megalopolis which is growing around the delta of the pearly river. Tokyo’s view is a varied mix of modern architecture, from towering glass to eccentric live capsules from the 1970s. The capital of Japan is one of the few places where you can see the centuries-old Shinto Shrine standing just a meters away from a skyscraper disappearing in the clouds. One of the most darkest and interesting buildings in the city is the temple Reiyukai Shakaden (A journey inside). Nothing is standing more scary on the Tokyo‘s silhouette than this dark, inclined pyramid, lined with black granite and crowned with two rings of gold. Reiyukai Shakaden is built in 1925 for Buddhism and has on big room for meditation and a big statue of Buddha. The middle of 20th century is a time of great experimentation in Japanese architecture, when the architects created places to live for the brave new world, breaking all patterns of the architectural tradition. The Nakagin capsule tower, part of the so-called metabolism architecture, led by Kisho Kurokawa, is maybe the most famous building, resulting from this social experiments. the building consists of two separate towers that serve as support of 140 pre-assembled capsules. Each capsule is a single small apartment. The original idea is that the capsules can be replaced with newer models, constantly keeping the standards of living in the building. Undoubtedly, one of the most famous architectural landmarks in Malaysia are the “Petronas Twin Towers” in Kuala Lumpur. Located on an area of 382,000 m², they rise at nearly 500 meters in height, with their 88 floors and 5 underground floors. One of the unique features of the towers is the air bridge that connects the two towers on the 41st and 42nd floors. The bridge, weighting 750 tons, is the highest of its kind, located at a height of 170 meters and 58 meters long. Another futuristic designs that impresses with its exquisite architectural integrity is the congress center – Kuala Lumpur. Located on an area of 22,000 m ² in the heart of the capital of Malaysia, this contemporary building is designed by the famous architectural company “Cox Architects & Partners”, in cooperation with “Akitek Jururancang Malaysia”. It is announced that by the end of 2018 the building will be expanded, on the occasion of the tenth anniversary, and 10,000 m² of additional space will be added.